This category contains 15 products and 3 subcategories. Here are the tools to coach your new and experienced agents to exceptional productivity: Up and Running in 30 Days, and your coaching companion show you exactly how to coach new agents to get a sale in their first month; On Track to Success in 30 Days System for Experienced Agents , plus your coaching companion, guides you in re-generating your experienced agents' careers, and gives you advice in 'up or out' coaching situations. Note: Are you interested in becoming a licensed CC Advantage 2.0 facilitator or coach? 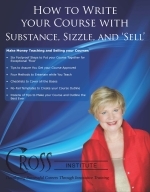 Check out our Carla Cross facilitator and licensing training and coaching programs. Do You Want More Production Faster--and Spend Less Training Time with your Agents? Instead of managers trying to cobble together a system to get their agents to productivity fast, Carla Cross has arranged several of her resources into a logical system she calls the Manager's New Agent Development System (NADS). Not only does Carla tell you what to use first, she has put the resources into a timeline. So, you know what to use first, and how to proceed to develop a great recruiting and training system. Now you don't have to worry about your agents wander aimlessly until training starts. Using Carla's recommendations, put a complete system in place to organize, coach, and train your new agents to production--fast. You'll save time, money, and get much more production--and retention. Step up your recruiting today as the market comes back. Get the processes and systems in place to recruit better and faster: Become Tomorrow's Mega-Agent Today (to provide your new interviewees to save time), The Complete Recruiter, Your Blueprint for Selecting Winners, and Objection Busters for Recruiters. Just wanted to drop you an email and say thanks for the help. Your program and literature is an outstanding value. I have digested the E-book Your blueprint for selecting winners, and have applied the program. 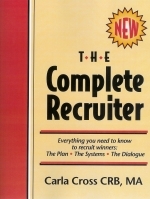 Furthermore, I am in the middle of studying and working through "The Complete Recruiter". 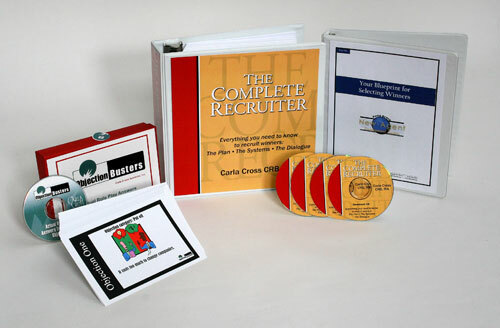 I'm still studying The Complete Recruiter, but have started my selection and recruiting program.. I do have a strategic plan and program for this phase of our business. I have already added one outstanding experienced Realtor and based on the needs / behavior predictor questions (you had suggested) used the kick out process to eliminate two experienced Realtors who wanted to join our company!